Looking for a fun family vacation destination? “Meet Me in St. Louis!” as the song goes. It’s my childhood home that I still visit quite often. 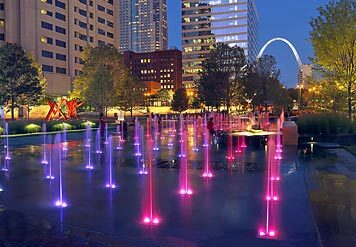 I love that you can have a great time in St. Louis and spend much less than you would in other cities. How about free concerts, free fireworks, a free day at the zoo, time to wander beautiful gardens, dazzling cathedrals, inspiring libraries, museums, and historical landmarks? All for free! You’ll save enough on all these freebies to splurge on perhaps the best indoor playground full of art and architecture ever. 1. The world-class St. Louis Zoo; how many zoos this big are still free? The zoo is set in Forest Park, the site of the 1904 World’s Fair. Admission is free, but parking is $15 per vehicle in the two zoo lots. If you arrive early enough you can find free parking in Forest Park somewhat close to a zoo entrance. That’s what we always did. You can come back to your car to have lunch at a nearby picnic table if you like. Some zoo shows and attractions charge a fee–see link below for those details. The children’s zoo is free for the first hour the zoo is open. Summer hours are 8 am-7 pm. Click here for more details about the zoo. 2. The St. Louis Science Center has been voted the #1 free thing to do in St. Louis. It’s free to explore, but some of the exhibitions charge an entrance fee. Let the kids enjoy everything while you relax in the air conditioning. It’s located in Forest Park at 5050 Oakland Ave., St. Louis. Click here for their hours and latest exhibits. Free parking. 3. 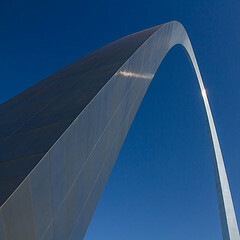 The St. Louis Gateway Arch is awesome when you stand at the base of one of the legs and look up. Click here for more info on the Arch. It’s a great photo-op. The museum below is free and a nice orientation to the history of St. Louis being the Gateway to the West. You can go to the top of the arch for a price, but be warned, the air conditioning is not very efficient. The view from the top is good, but it’s from small windows. I’d skip the trip to the top if you suffer from claustrophobia. 4. Fair Saint Louis is the 3-day 4th of July party at the Arch. Bring your beach blanket to sit on the grass. Click here for the schedule for this year’s Fair Saint Louis. Bring some cool drinks and sandwiches for a free show near the Arch. There is usually an air show in the afternoon and various music groups perform throughout the day into evening. The nighttime fireworks display over the Mississippi River with the arch is awesome. All is free, but you can buy refreshments if you like. This year they have Trace Atkins, the Counting Crows, and many more music groups. Not too bad having free concerts and a gorgeous free fireworks show! You will have to pay for parking ($10? for the event) in the LaClede’s Landing area and walk quite a few blocks to the arch area. If you bring a cooler, make it one with wheels or plan to have help carrying it. You will be surrounded by crowds everywhere and the traffic leaving can be extremely slow. Free parties like this are very popular. 5. The Old St. Louis Cathedral built in 1834 is on the riverfront near the Arch at 209 Walnut St. It’s beautiful and serene inside and hosts many weddings. It’s worth a peek inside on your way to or from the arch. Not air conditioned, so go early in the day if possible. The Old Cathedral has a simple elegance, but for a more grand experience, visit the new St. Louis cathedral. 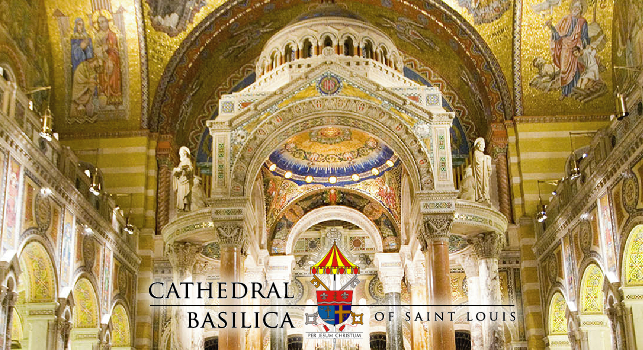 The newer cathedral is called the Cathedral Basilica of St. Louis and sits at 4431 Lindell Blvd., St. Louis. Prepare to be dazzled by the largest installation of mosaics in the world. It’s like a mini trip to Europe without the jet lag. The basilica is ranked #2 on Trip Advisor’s things to see in St. Louis, free or otherwise. 6. 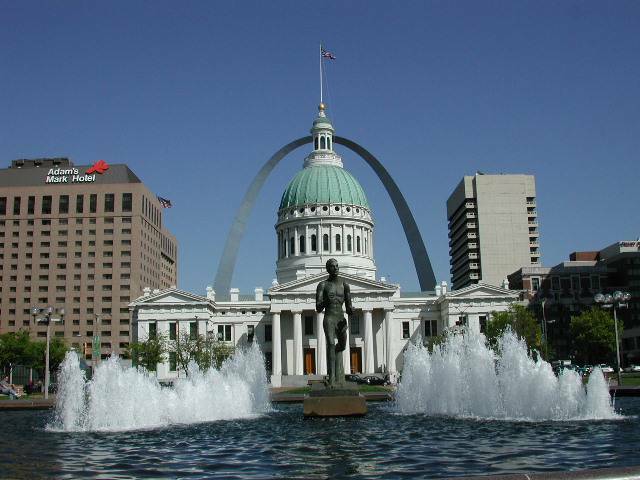 The St. Louis Courthouse is where the the historic Dred Scott case was first tried. You can wander around inside for free. Get an iconic photo (like the one at the top of this post) of the courthouse framed by the St. Louis Arch from Kiener Plaza park west of the courthouse. The park has a nice fountain as well as a large stepped waterfall. Streets flanking the park have gorgeous swathes of plants and flowers in the medians. The park makes a nice setting for a picnic lunch. There is a sunken amphitheater opposite the waterfall where you can sit, munch, and enjoy the scenery. Walk a block farther west to the award-winning CityGarden. Click here for good information on CityGarden. Families play in the fountains and bubblers and kids try to climb the whimsical sculptures along the path. It’s a fun way to cool off in the middle of the city. Take some pictures here! 7. Shaw’s Garden (Missouri Botanical Garden) has free admission and free concerts (Whitaker Music Festival) during the summer on Wednesday nights. Come after 5 pm and see as much of the gardens as you like for free. The kids will enjoy the Japanese Garden with the huge carp. There are sandwiches and drinks for sale at the concert, but most people bring their own drinks and snacks. Some people go all Gatsby with it, dressing up to have wine and a beautiful picnic repast. Bring a blanket to sit on. It’s nice to sit under the stars and listen to the music. We enjoyed hearing the late great Etta James here one night. Her “At Last” is a classic. Click here for the Whitaker Music Festival schedule. They are featuring a lot of blues, jazz, and indie pop this year. Click here for more info about the Missouri Botanical Garden. 8. The St. Louis Art Museum is in Forest Park atop Art Hill. There is a larger than life statue of “St. Louis,” the French king who gives his name to the city. He sits atop his horse in front of the museum and looks out over the lagoon below–perhaps remembering its glory during the World’s Fair. See the wiki here on the 1904 Word’s Fair. It was quite an event! The museum is medium sized, but it contains a huge “Waterlilies” painting by Monet that is an experience in itself. Here is the wiki on it to give you some of the flavor of the exhibits there. Free parking. 9. The Missouri History Museum is located in Forest Park as well. It has a wonderful exhibit of the World’s Fair and also one on Charles Lindburgh whose plane was “The Spirit of St. Louis. He trained in the St. Louis area and a replica of his plane is in the museum. Click here for more about the museum. I always like the antique toys on display here. Free parking. 10. The Central Public Library. Yes, a library. I’ve not been to this one yet, but it’s on my list for my next visit. It contains some of the most amazing architecture and impressive old lighting mixed with modern renovation. You can take a free tour and/or wander around at will. Click here for the reviews at Trip Advisor. It’s wonderful that something so beautiful can be a free public space. I have to list one place that charges admission. For family fun it’s hard to beat The City Museum. It is ranked #8 on Trip Advisor for all attractions in St. Louis. They took architectural remnants from old St. Louis and turned them into art, whimsy, and a giant fun house for kids of all ages. Recycling at its best! It has a school bus coming out of the side of the building and a plane hovering above the building. This is one place that is worth the money and so much better than going to a regular amusement park. Click here to find what they have floor by floor. Address: 701 North 15th St. St. Louis. M-Th 9-5. Call for other days when they have shortened hours: (314) 231-2489. I can’t possibly list everything St. Louis has to offer. It’s a fabulous place to have a good time that costs a lot less than in bigger cities. Come and enjoy! Click here for many more ideas including special interest itineraries. Click any of the tags below this post for more ideas. The “frugal travel” label links to more inexpensive destinations. My pleasure, Judith! Great to hear from someone from my old stomping grounds! I taught elementary school in the St. Charles and St. Peters area when it was still rural. I love the areas by the rivers in the STL area. We camped in the Tuscan area and loved it! What a beautiful place! I haven’t been to London, but maybe someday. It’s amazing how many great places there are to explore in the US. Thanks for taking the time to add your comment. I appreciate it! Thanks for listing the great and free things to do in St. Louis. I was born in Alton, ILL, across the mighty Mississippi and visited St. Louis often. I went to college in St. Louis and lived in St. Louis County most of my life. Now I live in Tucson, Arizona, another great small city in our country. In addition to some of the great places similar to St. Louis, there are mountains and lots and lots of hiking trails. Next to Tucson and St. Louis, my next favorite city is London, England. You are very kind, Buck! I love St. Louis! Maybe I should get hired as an ambassador! Ha-ha. Some people might want to put the St. Louis Arch on their bucket list. It’s a great city to check out! Looking forward to the other Bucket List Challenge posts. It’s been fun! Amazing list of activities Maggie! Are you secretly the Mayor of St. Louis? Their tourism board better hire you as their special ambassador. If I ever make my way to St. Louis, this post will be my guide. Thanks for joining the Bucket List Challenge! moneycone, it is. The people are really friendly and helpful. Also they like to have a good time! I’ve never been to St. Louis, but sounds like a wonderful city!